(From right) Dr. Tim Eckstein, Rev. Charles Campbell, and CW2 Kimberly Ferrante sing along with the 126th Army Band to "God Bless America" at a pre-concert gathering in Battery Park. 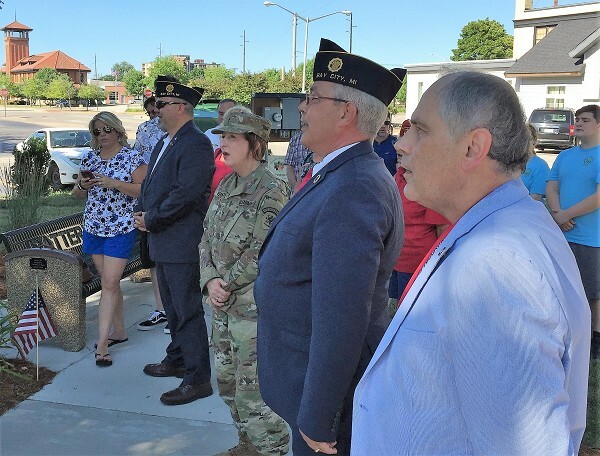 Bay Veterans Foundation and American Legion Post 18 hosted the 40-member "Governor's Own" 126th Army Band of the Michigan National Guard on Monday, July 2nd at 4:30 p.m. at Post 18. Following the private dinner, at approximately 5:30 p.m., an informal gathering of the band was held at the Michigan Gold Star Families Memorial Monument in Battery Park for a brief informational program. The program included an explanation of the monument, a prayer offered by Post 18 Chaplain Charles Campbell, and taps played by one of the band members. The band then proceeded to Wenonah Park for its scheduled performance at 7 p.m., sponsored by the State Theatre. "We are excited the Historic State Theatre is sponsoring this very popular band", said Dr. Tim Eckstein, commander of American Legion Post 18 and board member of the Bay Veterans Foundation. "What a great way for the Bay Area to kick off the 4th of July week and enjoy some great patriotic martial music." The 126th Army Band of the Michigan National Guard, the "Governor's Own" as of 2013, has been entertaining the citizens of Michigan for over 50 years. Based in Grand Rapids, Michigan, the band has earned praise from music critics and audiences alike. The band is assigned to the Michigan National Guard Headquarters in Lansing, Michigan, and is stationed at the Belmont Readiness Center in Belmont, Michigan. The tradition of military music in the Michigan National Guard dates back to colonial militia units at Michigan's frontier forts. Colonial regiments stationed at Ft. Detroit, Ft. Mackinac, and Ft. Michilimackinac all employed drummers, fifers, or buglers as signal musicians as early as the 18th century. At the beginning of the Civil War, State Militia Regiments were each assigned a Regimental Band which was often dressed and outfitted at the expense of the regimental officers. Many Michigan artillery, infantry, and cavalry regiments marched to war with such bands. During the Civil War, General George A. Custer, Commanding General of the Michigan Cavalry Brigade, ordered the band first into battle in a famous engagement at Brandy Station. By the middle of the war, it became apparent that the large number of regimental bands was taxing the pay, personnel, and support systems of the army in the field. General order 91 (July 29, 1862) disbanded regimental bands and allowed one band of sixteen musicians each per brigade. The 126th Army Band can trace its direct heritage back to the Headquarters Battery and Band of the 119th Field Artillery in Lansing. The Band of the 119th was active with the Headquarters unit during the Spanish-American War (at Santiago), World War I, and World War II. The 119th Field Artillery and inducted into Federal service on April 7 in Lansing. By 1943, personnel constraints in the U.S. Army once again caused the disbandment of all regimental bands and the 119th Field Artillery Band was disbanded on March 15, 1943, at Ft. Leonard Wood, Missouri. The 119th Field Artillery Band was then reconstituted and re-designated as the 46th Infantry Division Band on August 25, 1945. The 46th Infantry Division Band received federal recognition on December 16, 1946, and was commanded by Warrant Officer JG James H. Jennings. In 1956, the 46th Infantry Division Band was disbanded, reorganized, and moved to the armory at 7 Michigan Avenue NW in Grand Rapids. Warrant Officer Charles R. Berry was chosen to command the new 46th Infantry Division Band which was made up of members of the Lansing band and members from the band of the 126th Infantry Regiment which had been stationed in Grand Rapids before their disbandment and subsequent reassignment to the U.S. Air Force. In 1965, the 46th Infantry Division Band was moved to the armory in Wyoming, Michigan. Two years later, on July 24, 1967, the band was ordered into active Federal service for the Detroit Riots and released from active Federal service on August 2, 1967. On February 1, 1968, the 46th Infantry Division Band was reorganized and redesignated as the 126th Army Band and was relieved from assignment to the 46th Infantry Division. In 1973, Warrant Officer Paul Walters assumed the command of the band and held that position until his retirement in 1999. From 1999 to 2003, the band was under the command of Chief Warrant Officer Joseph Bruinsma and directed by First Sergeant Jim Zwarensteyn. In January 2014 the band moved from the Grand Valley Armory the new Belmont Armory. Today the band is under the direction of Chief Warrant Officer 2 Kimberly Ferrante and First Sergeant Devin Hahn. CW2 Ferrante enlisted in the United States Army as a musician in August of 1990 as a Piano Player. She served active duty with the 7th Infantry Division Light Band in Fort Ord, California followed by the 25th Infantry Division Light Band in Schofield Barracks, Hawaii. Upon the completion of her active duty tour in 1996, she transferred to the 126 Michigan National Guard Band located in Grand Rapids, Michigan while attending college. CW2 Ferrante resides in Lake Orion where she is employed with GP Strategies as a Learning and Development Project Manager. She has served for over 25 years as a musician in the Army Band Field. She has performed for military and civilian dignitaries from across the country to include President George W. Bush, and President and First Lady Hilary Clinton, Chairman of the Joint Chiefs of Staff General Shalikashvili, and numerous field-grade officers from all services and nations. In May 2013, the 126th Army Band was declared "The Governor's Own". The official ceremony was on July 2013 at the Camp Grayling Memorial and Review.